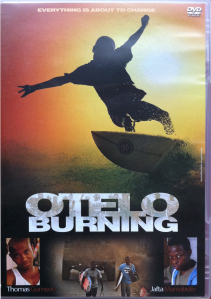 In August 2013, Meg Samuelson and I collaborated on an interdisciplinary project that considered the contemporary politics, shifting poetics and invoked pasts in the film Otelo Burning (2011), an isiZulu language film that uses surfing to pose questions about personal and political freedom during the demise of apartheid (1988-1990). An outcome of the project was the publication of several essays and an interview with Sara Blecher (producer, director) and Sihle Xaba (actor, surfer) in the Contemporary Conversations section of the Journal of African Cultural Studies, Volume 26, Number 3, September 2014. Meg Samuelson and Glen Thompson, “Introduction.” (Free Access to the article, which includes audio-visual supplementary material relating to the film and its reception). Meg Samuelson, “Re-telling freedom in Otelo Burning: the beach, surf noir, and Bildung at the Lamontville pool.” (Free Access to the article). Glen Thompson, “Otelo Burning and Zulu surfing histories.” (Open Access to the article).